Charles Village Street Collapse: Who is Responsible? I lived in Charles Village for most of Maryland life–we recently moved to Hampden, but Charles Village was where I lived during law school, two apartments, my first new home, and the infancy of our oldest daughter. By now, everyone knows about the collapse of the street at 26th Street between Charles and St. Paul streets. My wife called that area, pre-collapse, the most beautiful street in Baltimore. The rowhomes are idyllic, the greenery is perfect, and the whole area feels like a little island placed in the middle of Baltimore City. But now, it’s just chaos. Residents have lost cars, and have been evicted from their homes while the City and CSX try to figure out what happened, how safe it is, and what needs to be done to get everything repaired. Locals will tell you that it’s too little, too late, and that there have been several complaints made over the years to the City and to CSX officials. The general consensus is that repairs to cracks have been piecemeal and little more than cosmetic fixes. Right now, the estimate is that residents will be displaced for about 40 days. There is a program to help ease the transition, but it’s certainly inadequate. 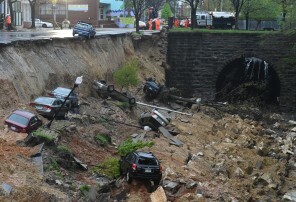 There have been reports so far that automobile insurers are denying coverage for vehicles lost in the street collapse. Who is responsible? It’s likely Baltimore City, CSX Transportation, or both. No answers have been given yet as to whether CSX was responsible for the retaining wall, or whether the City had the duty to maintain. There were several reports in the past years about the area’s stability, which will be pored over with a fine-tooth comb. Knowing the City and the corporate mindset, my bet is that they deny liability, and blame this on the “unpredictable” winter weather and recent storms. Of course, anyone who has lived in Baltimore knows that unpredictable weather is absolutely predictable. The street should have been designed and maintained to stand up to rough weather. Make no mistake, this is going to be a fight. Even if one or the other does the right thing and takes responsibility, they will likely fight tooth-and-nail over exactly what they have to pay homeowners and car owners. Keep a journal–at least once a week (more is better) you should document how this has affected you. Record time spent dealing with the fallout, money and mileage to take care of consequences. Document every phone call. Don’t hesitate to document your emotions. Inventory all of your affected property–if your car was lost, be sure to identify what was in it, and what the value was. Contact your homeowner’s insurance and automobile insurance to get full copies of your policies. They may deny you coverage, and you’ll need the policies to fight them. Don’t give a recorded statement to any insurance company. They’ll just use this against you later. If you have questions about your rights, give us call at 443.850.4426 (attorney’s cellphone) or send us an message through our online portal.